Look up! 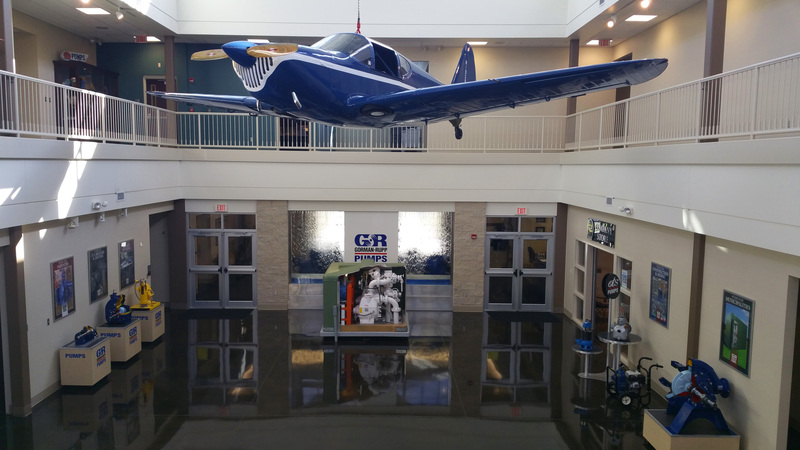 Visitors and employees walking through the atrium of the Gorman-Rupp Headquarters in Mansfield, Ohio, will see an unusual item! Overhead was recently suspended an airplane similar to the first company aircraft, a Temco Swift, originally produced in the 1940s, with a cruise speed of 122 kn (140 mph; 226 km/h). Former World War II Air Force pilot and current Chairman, Jim Gorman, recognized early in our company’s history the benefits of bringing customers to company headquarters for training, to answer questions, and allow them to experience our culture.